Stay fighting fit, with martial arts first aid! We are renowned for having a course specially designed for niches where a first aid knowledge is required. 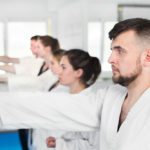 Our new martial arts first aid course teaches instructors and participants of the sport about injuries that could occur when practising martial arts. Alongside this, the course covers things like managing pre-existing health conditions, scene management and incident reporting. This online course offers flexible training delivery, as videos are accessible 24/7 from a PC or mobile devices. If you’d like practical training too, we have a network of approved instructors who can deliver a skills session after you complete the online course. With over 1,000 approved trainers across the country, classes can be held at your club or at an off-site facility near you. The content of this course has been independently certified as conforming to the Continuous Professional Development (CPD) guidelines, so come with a certified CPD statement as well as your ProTrainings certificate for completing the course. We also offer a Martial Arts First Aid course for students.